Profile: Ruckus is a deadly, devastating warrior whose usual state is a state of disrepair. This rolling bucket of loose bolts and peeling boiler-plate always looks like he just lost a demolition derby. It's not surprising that he's always willing to take the biggest risks on the battlefield, since he doesn't care what sort of shape he's in after the battle is over. All he cares about is winning. He is one of the bravest, nastiest and most daring of the Decepticons. He can be among 100 fighting Transformers and still stand out from the crowd. With his bullhorn voice, his high-amplification, stereophonic, constantly revving motor and his plunge-forward-never-retreat style of combat, he makes his presence known to all those around him, particularly those enemy Autobots who suffer the savageries of his onslaughts. 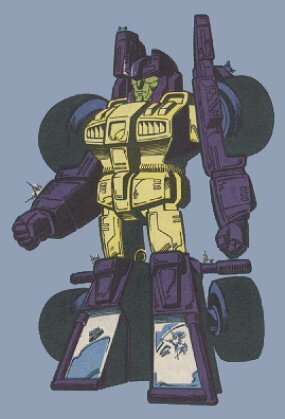 Millions of years ago, on Cybertron, Decepticon Commander Megatron employed Ruckus primarily as an errand droid. At that time, Ruckus was considerably smaller: He had been designed to perform only a non-combat messenger's role. But at the battle of Valvolux, Ruckus proved his true worth when, after having been caught by surprise behind enemy lines and smashed to pieces by an Autobot-launched proton missile, he was still able to warn an approaching squad of Decepticons of the impending Autobot ambush with the part of him that still functioned: his voice module. Megatron rewarded him by rebuilding him into the stronger, larger form that he still has to this day and by granting him status as a full-fledged Decepticon warrior. And Ruckus has returned his commander's faith in him with unflagging loyalty and unyielding effort. Abilities: In vehicle mode, Ruckus is particularly adept at ramming and running over opponents. He's been known to send the wheels of enemy vehicles flying in four separate directions with one of his charges. With his titanium nail-studded tires, he can grip and roll over virtually anything. He can achieve a maximum speed of 190 miles per hour and has a cruising range of 570 miles. He can expel a viscous, noxious-smelling oil-slick from his tail pipe that can send any vehicle in pursuit of him into an uncontrollable tailspin. In both vehicle and robot modes he is armed with heavy-duty rocket launchers that fire mercury-tipped exploding missiles. The detonation of a single missile can create a crater 50 feet deep and 500 yards wide. Weaknesses: Although not known to have any specific weaknesses, Ruckus's penchant for charging into battle without concern for his own well-being creates a constant need for spare parts to patch him up. Although he is usually suffering from several ailments at any given time, he rarely allows any of them to keep him off of the battlefield. He doesn't let pain stop him from doing his job.